Windows 8.1 Has stopped Working! What now... Windows RE? When Windows has stopped working entirely, meaning it won’t even boot anymore, or when you’re experiencing so much problems that Windows becomes unworkable, there is only one thing left to be done. The only thing that can be done, is to use the Windows Recovery Environment (Windows RE) to restore your system to the old glory! 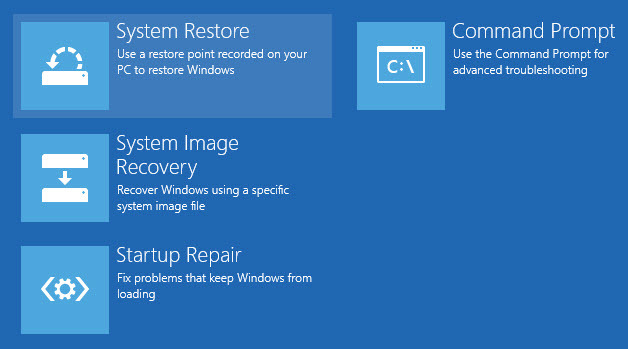 Windows RE has several recovery options that it offers to you, which includes a handful of essential tools for troubleshooting issues. This option is one of the most useless tools in the entire Windows RE environment that users can manually activate, since Windows actually actives this when it’s required, but it will always use it in the following situations. A Secure boot failure or error. But if Windows fails to detect the problems what then? Then you can enter the Windows RE environment by yourself and start the process, read How to access Windows RE to learn how. Open the right charm, then click Settings, then click change PC settings, then click Update and Recovery and click on Recover, then click on Restart now. Open an elevated command prompt and type “shutdown /r /o” and hit enter. Plugin a USB Recovery Drive or put a Windows 8.1 Installation disc in your system and reboot your system, click on any button when the message appears, press any key to …. Force your system to fail starting Windows twice, automatic Startup repair will start. If you have an old system you can still use the F8 trick, but many new systems will not react to the key, since the boot process is to quick and Windows does not register the key in time. Any of those 6 options will automatically bring you to the Windows RE interface. The Windows RE interface has multiple options the user can choose from, and all of them have a different feature (of course.) You can choose the option below to read what it does. Windows will attempt to start Windows normally, this option should be chosen if Windows for some reason decides that something went wrong, when nothing is wrong. Most people reading this post will not want this option. This option starts an automatic diagnostic tool that scans your system and finds and attempts to solve any problems that could cause a startup to fail, this option is recommended if you're sure that something is preventing you from starting normal. 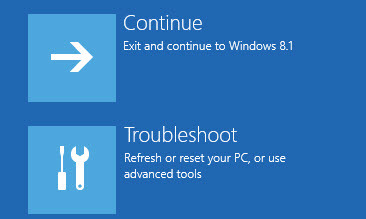 In most cases Windows will however automatically start this tool when it detects startup problems. This option starts an elevated command prompt that allows you to do manual recovery options, however this is something that normal users should not attempt!. 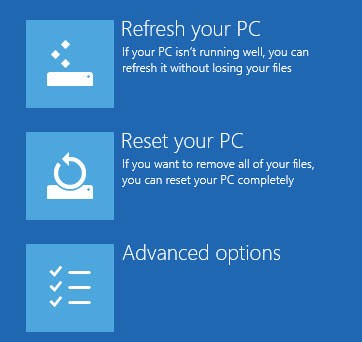 The most popular option in the Windows RE interface is the refresh your PC option, it changes all PC settings back to their default settings while keeping your personal data files, personalization settings, and all apps installed from the Windows Store. A less user-friendly option, this will replace all files on your system and do a full clean install, this means that all your files will be removed and that Windows will be installed like it was the first day you got the system, I like to call this functionality the “Nuke” option. You are troubleshooting if hardware or software is causing issues. Normal users should use the function Just remove my files, it removes the file headers, thus making them invisible for Windows and it will just write over them, however data restoration software will be able to recover partial or full files. Fully clean my drives will remove all files physically, thus making recovery software useless. After the Windows RE Reset Your PC function has been completed your system will be in the OOBE state as we like to call it, this means users will have to go trough the setting up users and such for their system.